Cambodia's government has approved a controversial hydroelectric dam on a tributary of the Mekong River. The joint venture involves Cambodian, Chinese and Vietnamese investment of $781m (£488m) and is due to be completed within five years. The project in northern Stung Treng province is known as Lower Sesan 2. Environmental campaigners say the dam will damage the river's biodiversity and devastate the livelihoods and homes of thousands of people. A government statement said the approval came after eight years of study into the possible environmental and social consequences. It said Prime Minister Hun Sen had ordered new homes to be built for an unspecified number of families who would be resettled for the project. Activist Meach Mean, of the 3S Rivers Protection Network (3SPN), estimated that more than 50,000 people would be affected by the dam. He called on the government to organise a public forum to discuss concerns before going ahead. "We are surprised by the approval," he told AFP news agency. "We don't know clearly about the process to build the project. We are really concerned about the impact on the people's livelihoods, water, and ecology system." In September, a report by UN human rights envoy Surya Subedi also raised concerns about the dam, saying communities did not believe they had been adequately consulted about the project. 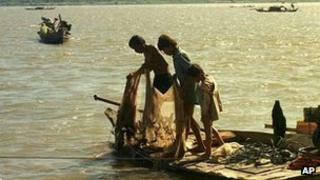 Damming the Mekong River has causes widespread controversy in South East Asia. Although hydroelectric dams allow countries to generate vast amounts of electricity, they also threaten massive changes to the ecosystem across the Mekong basin. In 1995, Cambodia, Laos, Thailand and Vietnam set up the Mekong River Commission to help manage and co-ordinate use of the river's resources.